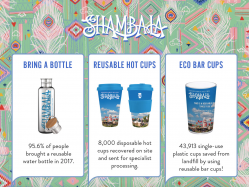 Shambala is committed to being single-use plastic free and, at this point, we’re pretty much there! No drinks are sold in disposable plastics, we have only reusable bar cups across the festival and there are no plastic straws. No food is served in plastic and you won’t find single sachet sauces. We encourage Shambalans to bring their own reusable hot cups, and charge a 25p levy per drink for disposable hot cups – which goes towards getting them properly recycled. We do not sell or encourage plastic glitter, and we are now even using reusable cable ties. Find out about the initiatives that have helped us to achieve this below, and if you want to dive into the plastic issue click HERE to find out the facts, why and how we are doing this, and how successful we have been so far. WHAT HAVE WE DONE AT SHAMBALA? Rather than focusing on trying to recycle more plastics, which isn’t really a solution for a number of reasons, we are designing them out of the festival ecosystem through three key initiatives. Since 2014, we have had a site-wide ban on the sale of drinks in plastic bottles, instead asking our audiences to bring a reusable bottle. 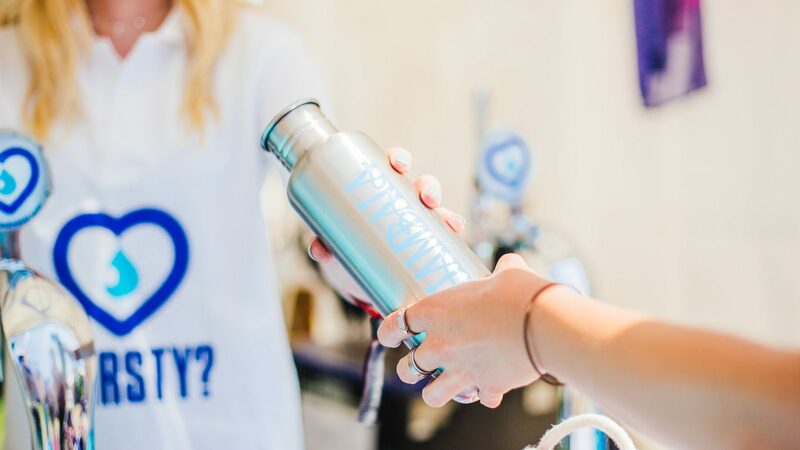 We have put in additional water points, offer free chilled filtered water at the bars and work with Frank Water who have a mobile hydration unit. We also sell stainless steel water bottles with 100% profit going to RAW Foundation and FRANK. Find out more here. Rather than disposable plastic or paper cups, we operate a reusable bar cup system. People pay a one-off £1 levy when they buy their first drink and then get a fresh cup when they return their cup (or a token) to the bar. After the festival all the dirty cups are taken to an industrial washing facility to be cleaned and reused for other events. Many lifecycle analyses find that reusable plastic bar cups used 3 times have a lesser environmental impact than a typical single-use cup despite the transportation and washing impacts. 2. Buy a beautiful Shambala Bamboo Ecoffeee cup in advance to pick up on arrival (or onsite from any cafe serving hot drinks while stocks last). You can pre-order yours now, under ‘Additional Items’ on our ticket page HERE. Read more about why we’re doing this, HERE. With Shambala now mostly being a disposable plastic free zone, we’re left looking at how to tackle the last fiddly and awkward bits: menstrual products, glitter and cable ties. In reverse order. Can we build a festival without traditional cable ties? We’re going to try. Finally – the last frontier in our quest to become entirely plastic free, is working with you lovely lot, to try and get you not bringing any plastic onto the festival site. We know it’s tricky, but please have a go – see if you can avoid bringing any plastic with you, or at least reduce wherever you can. Check out the Plastic Free Festival Guide HERE. A festival without glitter? Sorry glitter junkies, we have to accept that microplastics on our land or in waterways is a problem. And the jury is out on biodegradable glitters too, as there’s no evidence that these are much better, yet. If you’re dead set on facial decoration, we recommend cracking out the face paints or embracing the Avante Garden theme with paper petals and flowers, or even making a mask. If you must use glitter, please use make up remover and a cotton pad (not a wet wipe – but that’s a whole different conversation) to wipe it off, and put it in a ‘general waste’ bin, so it doesn’t contaminate recyclable materials. Let’s talk menstrual products. Whilst we are aware that some will think a festival has no right to instruct people on what menstrual products they choose to use, we can’t be fully disposable plastic-free without at least starting a conversation about this. Hundreds of people have their periods while at the festival. In 2018, we are encouraging all those who have periods to, if possible, choose plastic free menstrual products. They’re better for the planet, and better for your health. Download a free information sheet about the various plastic-free products on the market, HERE. Being on your period at a festival isn’t fun – we’re trying to ease the discomfort with a new, dedicated venue (The Red Sea Travel Agency – on hand to help you with your monthly trip!) Puns aside, this is a calm and comfy chill out space with dedicated toilets, hot water for your moon cup and hot water bottles for those that need them. This is also an information hub for those that want to find out more about ditching plastics from their periods.